Making the decision to update your home’s outdated and worn-down floors is easy and enjoyable when you shop with our flooring specialists. You may feel some concern about shopping for replacements, especially if you’re shopping on a budget. However, you don’t have to compromise on quality when you shop at our showroom. 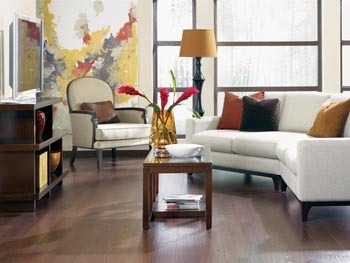 Visit today to explore your options for affordable, long-lasting laminate flooring. If you don’t have time to visit our showroom for a tour, it’s easy to find the perfect laminate floor for your project online. Browse our catalog to view hundreds of products manufactured by trusted brand names, or check out our Virtual Showroom Tour. There you’ll be able to view the stock in our physical location, as well as see what’s available now. You don’t have to settle for the limited flooring selection at your local big box store. Discover a world of laminate flooring products at our extensive showroom. Whether you’re searching for something modern and trendy or something classic and sophisticated, you’re sure to find a suitable flooring option at our store. Plus, our trained showroom staff is always ready to provide more information about our products. When you think of laminate, you likely think of the flooring material found in kitchens and bathrooms. However, thanks to modern advances in flooring technology, today’s laminate flooring works well in a variety of different rooms. Add yours to your bedroom, living room, or dining room – the choice is yours. However, you’ll soon discover that modern laminate certainly isn’t your mother’s laminate. For more than half a century, people throughout the country have prized laminates for their longevity and versatility. Laminate comes in many different colors, patterns, and textures, making it easy to find a product that suits your tastes and budget. Some types even imitate the appearance of high-end kinds of floors like hardwood and stone, enabling you to enjoy the stunning look of more costly floors without the price tag. The quality of your new flooring installation is as important as the quality of the products you purchase. That’s why we recommend you choose professional installation services when you’re ready to upgrade your floors. By choosing laminate floor installation with our licensed contractors, it’s easy to ensure your new floors look and perform the way they’re supposed to. Enjoy peace of mind knowing our team has the tools and experience needed to install your new floors to your satisfaction. Don’t compromise your home’s condition and value by settling for services from an amateur. Make a smart choice for your property and your budget by choosing our skilled and experienced installers crew. We guarantee your satisfaction with our work – otherwise, just let us know. If you spot any issues with your installation, we’ll return to fix them at our own expense. Additionally, if you don’t love your new floors after 30 days, we’re happy to replace them with a product you prefer. Contact or visit our showroom to browse our selection of laminate flooring products. We proudly serve Allen, Plano, McKinney, Frisco, and Parker, Texas, plus the surrounding areas.